Did you know there are (at least theoretically) two ways to get into heaven? It works something like getting out of jail and back into your home. Either you come up with your bail, or someone else pays it for you. You either have the funds, or you know someone who has the funds. Of course, if neither one of you can pay then you have to stay in jail. But that’s not the issue with heaven. Money is a common earthly currency. With enough money, you can do all kinds of things, gain all kinds of privileges, and get into or out of all kinds of places. Except heaven. Money can get you from jail to home, but it can’t get you from earth to heaven. No matter how much you spend or where you spend it, money won’t get you into heaven. Neither will earth’s other “currencies” – like doing good deeds or sincerely trying to do what’s right or attending church or having Christian parents. Heaven uses a different kind of currency: it’s called perfection. Only perfection buys your way into heaven. That’s hard for a lot of people to swallow; it seems so unfair. So they try to substitute a lower fee: trying to be “good enough” to get into heaven. That’s Method #1. 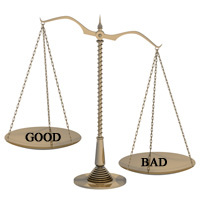 A lot of people assume that that when we die and meet God, He’ll be sitting in front of a balance scale. There He’ll put our good stuff on the “you’ll get into heaven” side of the scale, put our bad stuff on the “you’ll go to hell” side, look at the results, and make His decision. If He sees that our good stuff outweighs the bad, we’ll get into heaven. If He finds that our bad stuff outweighs the good, we’ll go to hell. That’s not how it works. The “you can be good enough to get into heaven” theory depends on our being relatively good (compared to others who obviously don’t qualify). But getting into to heaven doesn’t depend on relative goodness; it depends on absolute goodness – i.e. perfection. Only the perfect get into heaven. Either we manage to attain perfection ourselves (method #1), or we know someone who will give it to us (method #2). And that’s where Jesus comes in. Did you know that falling short of perfection carries a death penalty? Not just earthly death, but death for eternity. Since we can’t make ourselves perfect, we need to find a friend who is willing and able to make us perfect. That’s what Jesus did on the cross. He substituted His death for ours. He paid our bail. He bought our way out of jail. Colossians 6:19-20 …you are not your own … for you have been bought with a price. 2 Corinthians 5:17 Therefore if any man is in Christ, he is a new creature; the old things passed away; behold, new things have come. Have you thanked Jesus for His gift of the cross? Have you asked Him to apply the cross to you? *Read about the details of this profound identity shift in my book, Grappling with Your Identity, available from the BibleGrapes Bookstore or through Amazon.com. ← What Happened on the Cross? Suffering AND Joy.